Greetings to all of our club members, visitors, and guests! We welcome you to the regular meetings of the North Houston Astronomy Club on the 4th Friday of every month. The Kingwood campus is located on the west side of I 69 (US Highway 59), north side of Kingwood Drive, and NW of the Kingwood Medical Center. Click below here to see the Map and Driving Directions! All Members, Guests, and Visitors park at the Parking Lot C across the Sortes-McClellan Road. The CLA building we both the novice and general meetings gather is building 4 as shown on this map. 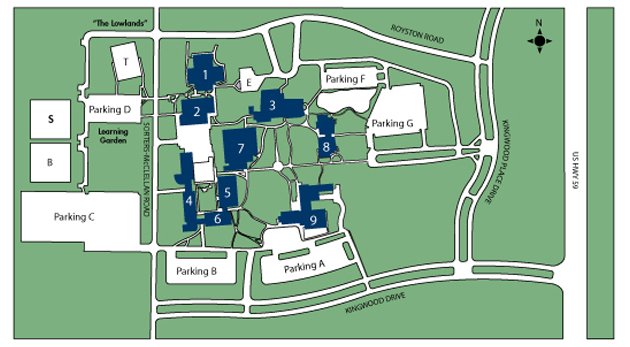 Click on the image above to get a pdf file with more information about the campus layout.